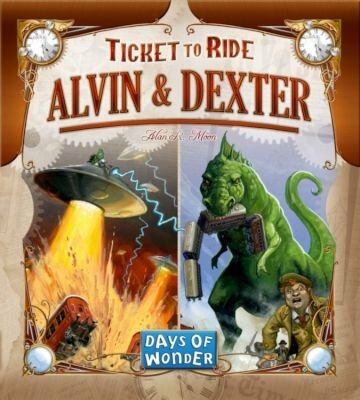 Meet Alvin & Dexter - two detailed monster figures that bring their own special brand of chaos to cities across the Ticket to Ride landscape. Alvin (the Alien) and Dexter (the Dinosaur) are two wacky characters ready to help you stomp opponents and zap tickets in this fun expansion. But don't take them too lightly; they also introduce a devious new tactical layer to the game. The last two players to start get to place the monsters in different cities on any Ticket to Ride map. It doesn't matter which map - Alvin and Dexter are just as adept at rampaging through London, Zurich or Stockholm as they are in New York or San Francisco. Once a monster moves in, it's now a City in Chaos - no one can build a new route into or out of that city until the monster moves on! Players may move a single monster to a different city anytime during their turn by turning in 1 or 2 Locomotive wild cards and moving the monster up to 3 cities away for each card they discard. The player who moves Alvin (or Dexter) the most during the game will also earn a bonus. Any Destination Tickets that include cities that Alvin and Dexter occupy at the end of the game are worth only half their normal point value! This is an expansion. An original copy of any complete board game from the Ticket to Ride series is required to play with the Alvin & Dexter Monster Expansion.